Freight equipment leased or owned by the McCloud River Railroad that doesn't fit into the other pages in this section will be covered here. Unless noted, the railroad leased all cars on this page from Itel and/or GE Capital. In most cases, business decisions or other considerations caused these cars to be registered to the McCloud River/McCloud Railway, and they had little to no contact with their home rails. 20006, 20009, 20011, 20111, and 20147: 40-foot PS-1 type steel boxcars, purchased 9/24/1963 from the Western Pacific. The cars did not have a long life in McCloud and may have been purchased to test an idea railroad president Flake Willis had for an open-topped boxcar designed to make the railroad cost competitive with trucks for lumber traffic to California. On 8/27/1965, Flake Willis requested that WP lease 100 additional identical cars from their 20000 and 21000 series to McCloud to be placed in service carrying U.S. Plywood symbols, but this transaction apparently never occurred. 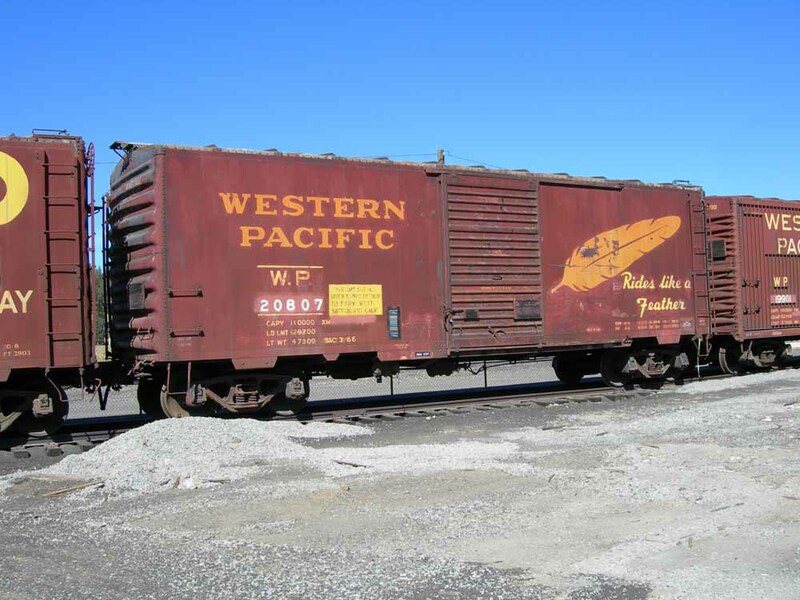 WP boxcar #20807 is from the same basic series as the five cars the WP sold to the McCloud River. This car is preserved in the collection of the Western Pacific Railroad Museum in Portola, CA. No photographs of the five cars sold to the McCloud River have so far surfaced, nor has any real information on why McCloud bought the cars in the first place. 3010, 3012, 3014: 60-foot, outside braced, double door steel boxcars, built 1963 by Pullman-Standard Car Manufacturing for Pullman Leasing Company. Likely leased late 1968/early 1969. Conveyed 1971 to Green Bay & Western Railroad #82-#84. 9300-9393: FBS-class 61-foot bulkhead flats. Cars in this series numbered 79 in 1994, 98 cars in 1996, 90 cars in 1997, 87 cars in 1998, 10 cars 1999-2003, and 4 cars 2004-2011. One car (MR 9393) scrapped late 2006 in McCloud. Flat #9393 in McCloud in June 2004, two years before the railroad scrapped the car. 21200-21229: FB-class 56-foot, 8-inch bulkhead flats. 30 cars reported in 1991 and 1992 only. 1700-1814: RBL-class 52-foot refrigerator cars. Cars in this series numbered 65 in 2003, 110 cars in 2004, 104 cars in 2005, 90 cars in 2006, 53 cars in 2007, 3 cars in 2008, and 2 cars 2009-2011. MR #1727 is one of the few cars of this class to have paid a visit to McCloud. 6000-6099: XP class 50-foot, single door boxcars, primarily intended for paper service. Cars in this series numbered 100 in 1996, 98 cars in 1997, 25 cars (numbered 6075-6099) 1998-2009, and 24 cars 2010-2011. 6100-6174: XP class 50-foot, single door boxcars, primarily intended for paper service. Cars in this series numbered 75 1997-2004 and 74 2005-2011. 12000-12512: RBL-class 52-foot refrigerator cars. Itel initially leased 494 of these cars to McCloud River on 6/26/91. 394 of these cars had previously been leased to two other roads (Ferdinand & Huntingburg and Louisville, New Albany & Corydon) and assigned to the Modesto & Empire Traction company for packaged food service. M&ET requested that the cars be remarked to the McCloud River. Itel and McCloud agreed. Under the original agreements, McCloud River leased 100 cars from Itel, to be numbered MR 12000-12099, with those cars assigned to M&ET while the rest of the involved cars were reconditioned and restenciled. However, 13 cars were not remarked to MR, and the Federal Railroad Administration found MR 12062-12066 unacceptable for packaged food service. In a subsequent agreement Itel and McCloud River removed these eighteen cars from the lease and replaced them with eighteen other cars, numbered MR 12101-12118, and added five additional cars numbered MR 12119-12123. The 394 other cars were to be numbered MR 12124-12517, but subsequent Official Railway Equipment Registers suggest only 19 of those cars ever received MR reporting marks and numbers. Cars in this series numbered 130 in 1991, 129 cars in 1992-1993, 130 cars in 1994, 121 cars in 1996-1998, 117 cars in 1999, 115 cars in 2000, 114 cars in 2001, 92 cars in 2002, 84 cars in 2003, 77 cars in 2004, 76 cars in 2005, 53 cars in 2006, 11 cars in 2007, 3 cars in 2008, and 1 car 2009-2011. Most of these cars appear to have been restenciled to M&ET. 45100-45189: HTS class 47-foot, 4-inch, 3600- cubic feet, 100-ton capacity rotary quad open top hoppers. McCloud River leased 90 of these cars from Itel on 6/15/89, with all cars assigned 6/5/89 to Union Pacific and Missouri Pacific. Cars in this series numbered 90 1991-1993 and 25 cars in 1994. WGR Flats: Shortly after the McCloud Railway took over the property, the new company reached a deal to use a large number of ex-Illinois Central bulkhead flatcars then registered to the Willamina & Grande Ronde Railroad of Oregon. These cars- painted a light green with WGR reporting marks- were common on the McCloud Railway for the first couple years of that company's operation. The railroad used the cars in both freight and maintenance chores. Centerbeams replaced the cars, and they disappeared from the property by 1997. 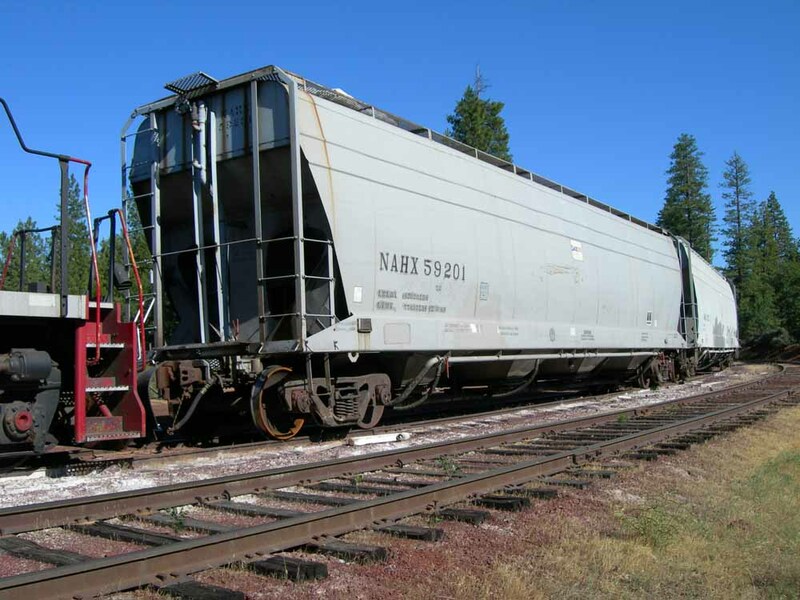 Dicalite Hoppers: While these cars were not owned or leased by the McCloud River Railroad or McCloud Railway, they did play an important role in the operations of both companies. When Dicalite opened the reload at Cayton about 1986, they decided to ship both bagged and bulk products over the railroad. 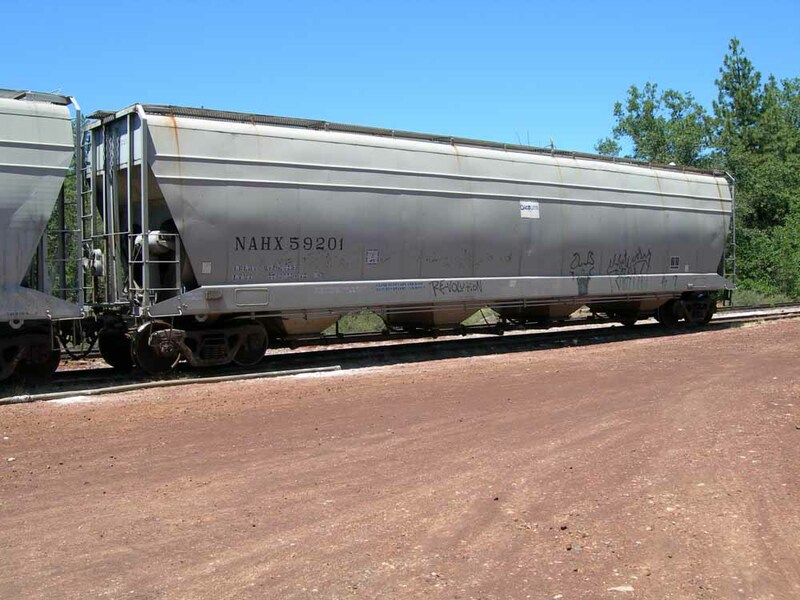 Dicalite decided to use compressed air to blow the bulk product from trucks into railcars, and to handle the traffic Dicalite leased a fleet of covered hoppers equipped with pressurized air pipes and other equipment to facilitate loading the cars. Dicalite continues shipping by rail in 2012, with their hoppers loaded at a reload on the BNSF at Nubieber. Two views of a Dicalite hopper at Cayton in June 2006. Jeff Moore photographs.